There has been a lot of buzz lately around our new Fish Hub program, with stories airing on KAZU and KION as well as articles in Edible Monterey Bay and Civil Eats. Which is prompting a lot of people to ask: what exactly is a fish hub? Here we explain the why, the what, and the who of this new program to rebuild local markets for Monterey Bay seafood. Talk to any commercial fisherman who has been around for a while, and they’ll speak nostalgically of a time when Monterey Bay’s ports were bustling with commerce and activity, and local restaurants and markets were filled with fresh, local seafood. But today, there are more sailboats than fishing boats in the harbors, and tourist shops have replaced the boat repair and bait shops. It’s far easier to find tilapia from China or rockfish from Canada in local markets and restaurants than it is to find fresh, local, sustainable rockfish from right here in the bay. Sadly, this is not unique to Monterey Bay; in fact, more than 90% of the seafood we consume in the United States is imported from other countries. So what happened? The answer is complicated, but essentially the groundfish collapse in the late 90’s caused a series of cascading events that have led us to our current state; commercial fishermen stopped fishing, fishing infrastructure (like ice machines and processing) languished, cheap, foreign imported fish filled the market void and subsequently, consumer appetites changed. In the years since, relief efforts have been instated, new management structures have been built, conservation efforts have been implemented, and fishermen have innovated with gear and technology to reduce environmental impacts on both fish and habitats. In an exciting turnaround, several important fish stocks have rebounded. Today, the groundfish fishery is considered an environmental success story. Yet our markets and restaurants continue to be filled with cheap, foreign imports, while locally landed seafood is shipped out of town. One thing has become abundantly clear to us over the past few years - whether you are a fisherman, a fish buyer or market, a chef, an environmentalist, a municipal leader, or a consumer, we all want the same thing - to see local, sustainable seafood back on local dinner plates. But this is no easy fix. Relationships have been built between markets and the distributors that provide them with reliable, consistent, and affordable seafood. Consumer tastes have moved away from local rockfish and Dover sole, to imported salmon, shrimp, and tilapia. So, we started exploring ways that the Monterey Bay Fisheries Trust could support the region’s seafood economy, and we landed on a ‘fish hub’ model that takes its cues from the success of terrestrial food hubs. A food hub can be anything from a virtual website or coordinator that helps with aggregation and distribution, to a full-scale facility with storage, processing, distribution, marketing, retail, and more. While each food hub is different, they all share the same goals of rebuilding community access to healthy, local foods, and producer access to local and regional markets. Several hundred food hubs now exist across the country, and have demonstrated success at building and scaling local and regional markets for produce and meat. In 2016, we recruited the consulting firm Karen Karp & Partners (KK&P) to examine whether a seafood based food hub, or “fish hub” could help solve local market challenges. After extensive research and community feedback, they recommended that the fish hub start as a network helmed by a Supply Chain Manager. With funding support from the City of Monterey, Monterey Bay Aquarium, National Fish and Wildlife Foundation, and Monterey Peninsula Foundation (host of the AT&T Pebble Beach Pro-Am), we hired Roger Burleigh as our new Marketing and Supply Chain Manager, and we are off to a great start. So what exactly will the Monterey Bay Fish Hub do? Our initial strategy does not include investing in a physical processing facility or other physical fish hub headquarters, nor will we hold any inventory – though this may be in our future. The primary goal of the fish hub is to rebuild market demand for Monterey Bay seafood. Over the coming months, Roger will meet with a range and diversity of local and regional buyers — including high volume institutional markets — to seek out market opportunities for sustainable, Monterey Bay seafood. He will aggregrate supply and demand and orchestrate the logistics from boat to market, leveraging existing infrastructure (e.g., processing and distribution services) to start. Over time, we expect that increased and consistent demand for Monterey Bay seafood will attract more fishermen and more landings, which will in turn inspire investments in shoreside businesses and infrastructure like ice, hoists, and processing. An important part of the fish hub will involve educating the public about local seafood and the importance of commercial fishing to our history, culture, identity, and economy. Through our website, social media, newsletter, presentations, events, and through local press and partnerships, we will work to tell the story of the fish, the fishermen, the Monterey Bay, and what the fish hub accomplishes. Increasingly, buyers and consumers want information about where and how their seafood was caught. 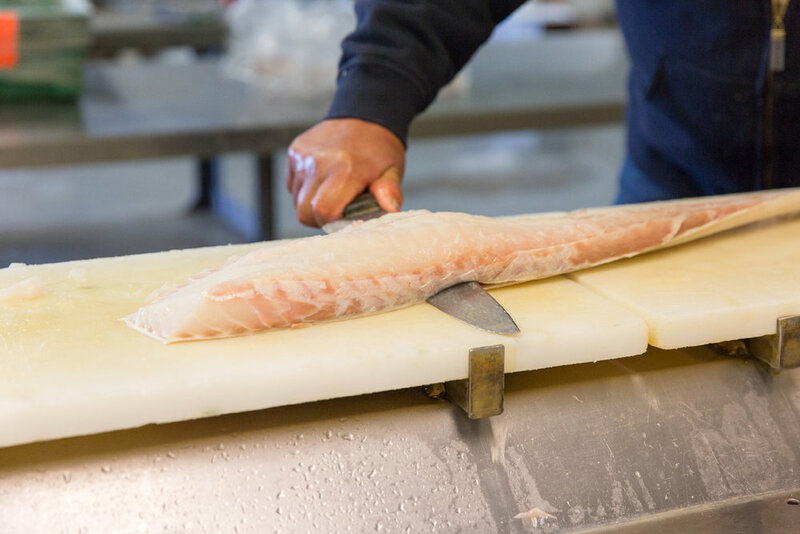 One of the early goals of the fish hub will be to explore a traceability program that verifies the source, gear type, and sustainability of Monterey Bay seafood. We hope that menus will stop listing generic ‘rock cod’ (which could come from anywhere on the West Coast of North America) and start listing source-identified and verified “Monterey Bay caught Chilipepper rockfish” (for example) with information available on the gear type, vessel, and possibly even the captain. This technology is available, and we plan to explore whether it could work for Monterey Bay. As we gear up, we’ll be working with community partners to increase business and capital support for commercial fishing businesses, so that they can thrive once again. We expect the Fish Hub to evolve as we develop and grow new markets and fishing opportunities, and we are excited to see where this takes us!